It's a little tricky to get going with a novel like this. The novel begins with a premise cribbed almost directly from Ray Bradbury's Farenheit 451, right down to the ironically-named fascist enforcers. The first few chapters read a little like a Bradbury homage, including even the grand-master's tendency towards stilted dialogue and clunky exposition. Fox's protagonist- Louis Schmalzberg, former liposuctionist, MD-is one of the founding members of the Good Humor Men. The story opens with Schmalzberg and pals finding an old stockpile of government cheese and torching it; the ironic replacement of Bradbury's books is definitely striking, but lacks the deep-seated horror implicit in the act of burning books. Fox relies heavily on the engaging power of Schmalzberg's first-person narration here; there's an ease of voice that helps to carry the reader through some of the early false starts. It's after this slow opening however, that The Good Humor Man really begins to fulfill its gonzo promise. Schmalzberg, in order to appease his guilt about his senile, decaying father, goes on a road-trip from California to Miami Beach in search of a family heirloom that he'd sold years ago to pay for his wife's cancer treatments: a jar of belly fat that Schmalzberg senior had liposuctioned off of Elvis Presley, right before the king had taken his leave of the world. Schmalzberg junior contends with the terrifying might of the Graceland Foundation, run by an obsessive covered in Elvis Presley tattoos; a criminal mastermind in New Orleans who is trying to rebuild Mardi Gras by smuggling in beignets; and a mad doctor who has founded a cult that takes liposuction as its chief sacrament-all while being pursued by a murderous French Turk and an accidentally-engineered wasting disease ravages the country, bringing America closer and closer to a starved, whimpering end. Where Bradbury's protagonist spends his time embroiled in a war with a totalitarian state whose Firemen are its short-sighted long-arm, Fox's Schmalzberg is subjected to a pageant of grotesqueries to which the Good Humor Men are almost ancillary. At its root, The Good Humor Man is a story exploring the schizophrenia America suffers from when it comes to fat and self-indulgence. The idea of Elvis Presley, more important to the narrative than his literal remains, is one that Fox uses to reconcile the American obsession with expurgation and self-denial and its seemingly insatiable gluttony and love for excess. Fox cleverly avoids pinning the blame for any of these catastrophes on any particular institution. Yes, the government is to blame for the Good Humor Men; yes, MannaSantos' GMO crops are responsible for the wasting disease; yes, the Graceland Corporation's cynical manipulation of religion is responsible for the cult of liposuction. But the plethora of causes and consequences points to an underlying flaw in human nature itself. It's always human beings who, inadvertently or not, call their punishments down on themselves: the Good Humor Movement, after all, started as a grassroots phenomenon. In fact, Fox's presentation of the Good Humor Movement-the neo-fascist organization that, in order to preserve an overburdened healthcare system from the catastrophic expenses associated with obesity-doesn't just seem frighteningly plausible; the way Schmalzberg describes it, it actually seems like kind of a good idea. The underlying intelligence of the novel is its recognition that, even in organizations whose actions are manifestly evil, the individual members of that organization imagine themselves to be doing good. Fox's keen eye for human nature does, occasionally, seem a little skewed. Schmalzberg's commitment to careening across the country for a jar of preserved belly fat while the world is literally in jeopardy does stretch the limit of credibility; it may be fair to say that Fox's own reverence for the departed king sometimes outpaces the reasonable motivation he might provide. But the breakneck-pace, the sheer absurdity of the world that Fox has crafted, is enough to distract until the end, which manages to to bring everything back together with a kind of enviable, intricate brilliance that literally ties up every single loose end. The Good Humor Man is an intensely interesting, wild ride through a wickedly-accurate depiction of the American psyche that, fortunately for all of us, doesn't bother hewing too closely to its ideological forebears. This is more than just a goofy reversal of Bradbury's classic, but a witty, incisive satire all on its own. By turns heartbreaking and mesmerizingly grotesque, The Good Humor Man is well worth the read. 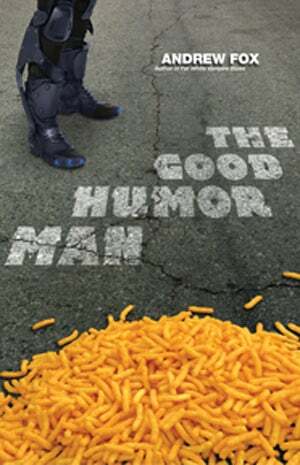 Pick up The Good Humor Man from Tachyon Publications.